April is here and so is full blown Rattlesnake season. 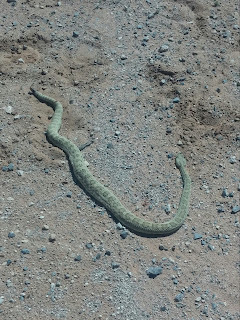 Although I have encountered as many as four rattlesnakes in the month of December, the spring is well rattlesnakes will exit their dens and remain above ground until the fall in most climates. I have yet to see one this year, but I'm sure I will soon. Coming out of hibernation and hungry, rattlesnakes will be pretty active. Pretty easy to see and avoid in the desert, it becomes harder when the growth of grass and weeds start providing ground cover especially after a sporadic rain. But the last few times I have ridden with other people and have encountered rattlesnakes, they were in plain sight and almost walked on top of. Movement is more easily detected, so objects not moving are often undetected. Your sub-conscious gets used to see mostly vertical lines and shapes from vegetation growing out of the ground, so often a horizontal shape of the snake draws our attention. The good news is that rattlesnake bits are rarely fatal, however their venom, which differs from species of rattlesnake, has some nasty side effects. Oddly enough, I met a Vet last year who told me he had two cases of fatal snake bites to horses in a week or two span. Older horses or horses with immune system compromises would likely be at higher risk. Horses are usually bitten on the legs, nose or head area. The nose is obvious as horse's are curious animals and this presents big danger as nasal passages can become swollen and closed off. I carry some sections of surgical tubing coated on the outside with vaseline or bag balm then vacuum packed in a small package with a food saver, just in case. Rattlesnakes have different levels of hemo or neuro toxins which have different effects on the horse. Neurotoxins being more of a threat, given a large dose of venom, as it threatens the nervous and respiratory systems. I have some of my friends tell me that horses of theirs have been bitten in the legs by Western Diamondback Rattlesnakes, who carry a larger percentage of hemotoxins (affecting the capillary system and therefore the muscles), and the resultant toxins and swelling has greatly reduced blood supply carrying nutrients to the hooves and resulting in a horse foundering (laminitis). 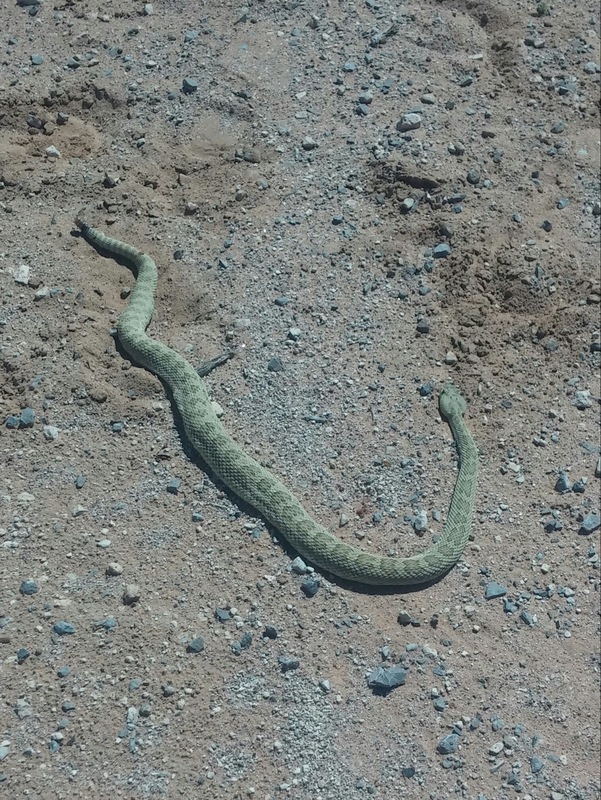 There is a equine rattlesnake vaccine called Crotalus Atrox Toxoid that was primarily developed for protection against the Western Diamondback Rattlesnake bite. It is thought to also provide some protection against other specific closely associated with the Western Diamondback and may also provide a little protection against the Rattlesnake species with mainly neurotoxin venom such as the Mojave Green. As safe as the vaccine studies make it out to be, I choose not to immunize my horses to rattlesnakes only because I'm a little leery of the side effects to the vaccine, again even though they are reported to be limited. Plus it can be expensive. But if your horse is bitten you need to get him to a Vet just as soon as you can. In most cases, I would get off him and walk to a point where someone can meet you with a trailer for transport to the nearest equine Vet. Being able to identify the species of rattlesnake would be help, but not to the point where you waste a bunch of time trying to catch and kill the snake and place yourself in danger of being bite. Depending on the timeline and with the Vet's concurrence, I may give my horses a Banamine injection. After bite care will likely include keeping the bite site clean, hydrotherapy to reduce swelling and giving your horse anti-biotics. Just be careful when you are riding. Don't count on getting a warning, Rattlesnakes will not always rattle to warn off people or animals, in fact in my experience, more often than not you will not hear the rattlesnake rattle. Many times when riding in a file, it won't be the first but will be the second or third horse and rider who hear the snake rattle. Rattlesnakes will not always coil before striking either. Baby rattlesnakes are even a bigger hazard than full grown mature rattlesnakes. The babies are born live in a thin egg like membrane material which they break right after birth. They are born with a full load of venom and have not learned to control the amount they inject into a bite meaning they will often give a full load of venom unlike a mature rattlesnake which often induced "dry" bites. Hope it never happens to you, but just in case, have a plan on what you are going to do if one of your horses, or even you, get bite when on the trail. Always having a cell phone on you is a good idea so you can call for trailer support and call your Vet.